Students enjoying the end of the summer bridge program during our class party. Three weeks have flown by since I started teaching at the Summer Bridge program and my students will be happy to part with me for their summer vacation before Fall classes tomorrow, while I will be wishing we had more time to really get down to work! I have been in Macau for almost 1 month now and this 3 week summer program at the University has been a great introduction to the English Language Center that I am working at this year. The students in the Summer Bridge Program are all recent High School graduates and it is their first time taking any University affiliated course. Most of them were accepted into the program with the understanding that they pass this summer course in order to enroll into classes in the Fall. With a lower English level, these students need a brush up on their basic English skills as they have been taught English in Chinese for the past 6 years. And even more exciting, they need a crash course in Western teaching philosophy that requires class discussion and group work where their ideas are appreciated and heard. "I can raise my hand?" a student asked me during the first week of class. I was shocked as I watched my students struggle with the adjustment of being told what to do instead of deciding what to do. I realized quickly that my students have never had to think for themselves and were used to an environment where they simply filled in the blanks and did extremely rote activities to reinforce concepts, rather than using the language in a more natural way. This is when a team game was introduced to the class in which the students had to match sentence strips under the category of Western Teaching Philosophy or Eastern Teaching Philosophy. Then after a discussion, the students were able to write on the topic and state the pros and cons of each philosophy and/or which one they preferred. To my surprise, all of the students chose Western teaching philosophy even though I explained to them that I would mix both styles of teaching in my classroom. They stated that they liked not focusing on a book and actually being creative because they felt they could contribute more to their society. Their words were very powerful to those that understand the lack of creativity that they were previously allowed in their learning experiences. There is alot to say about this 3 week program, but overall my opinion is that it is too short to accomplish any deep learning. I tried my best to thoroughly cover all of the most important information while teaching them basic skills to survive in a University setting. A majority of my class didn't even know how to organize a notebook and I quickly realized that I needed to make that a part of the class grade to get them to pay full attention to staying organized. They actually showed up to class with mini mouse notepads and some of them without lined paper or pens and pencils. This seems almost non-nonsensical to most American teachers as these skills are reinforced at a young age, but my Chinese co-worker reminded me that the students are known for being "spoon-fed" and catered to their entire lives even during their schooling. This is a much bigger problem than I thought it would be. I have taught in Asia before in Korea and Japan, but never have I experienced the "spoon-feeding" non creative mindset with such full force. Here in China, even in a more free environment in the Special Administrative Region of Macau, students are not taught to think for themselves at a young age. This is something that I truly think hinders them as they begin their college careers, where most of them will be thrown into all English classes with Western teachers who will be shocked at their lack of discussion skills. As the 3 week period wraps up tomorrow, my class will enjoy a relaxing day of playing English games and watching Ice Age 3 over lunch together. This is something that I look forward to at the end of my classes where the students can get to know me on a more personal level and reflect on the time that we had together. 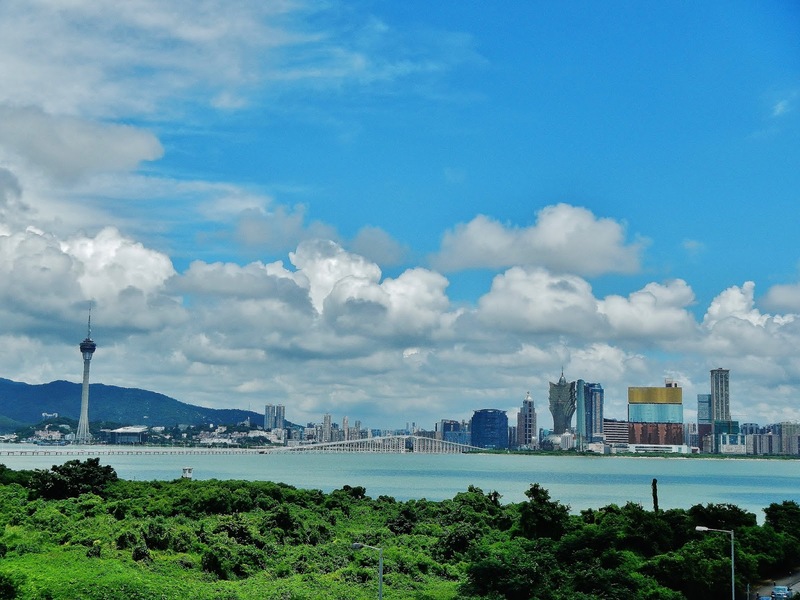 A view of Macau from the University of Macau on Taipa Island. I've had a little of that problem here in Korea. The students memorize from their books but have a hard time putting words into an actual conversation. Awesome view of Macau from the University! Thanks Tim! Yes, sometimes language is the reason, but here it seems to be the lack of critical thinking skills. Many of them simply have not been taught to form their own opinions before entering university.